I have been more excited for this pattern to release than maybe any I've ever tested. When I showed my husband what I was making him he said "I wont wear a vest." I thought I'd make it anyway just in case. Then life got busy and he was still adamant about not wearing it so I almost dropped out of the test. I am beyond glad I didn't! I am in love with it and he hasn' stopped wearing it. He has since requested another, as well as a coat! So without further ado - the William Vest, brought to you by the amazing Marisa of Laela Jeyne Patterns. She has already released a women's version (Willa) and a kid's version (Billie) and I am pretty confidant that I now need all three. The pattern comes with lots of options, (all of which you can view on the shop website) like a removable hood, chest pockets, a zipper cover flap with snaps, and it can be reversible! Its also super easy to alter the pattern to make it fit your man perfectly. My husband is six foot two and very broad up top so I slashed the back piece and overlapped to remove some extra width at the bottom. I also added two inches and did a sloped shoulder adjustment. Most of these adjustments are included in the pattern - so bonus - you get those instructions, too! And Marisa is always around to give suggestions and is incredibly helpful. I did my welt pockets in a navy vegan leather from Girl Charlee and I love the contrast they give. Its pretty subtle since its all the same color, but I felt it took it up just a notch. 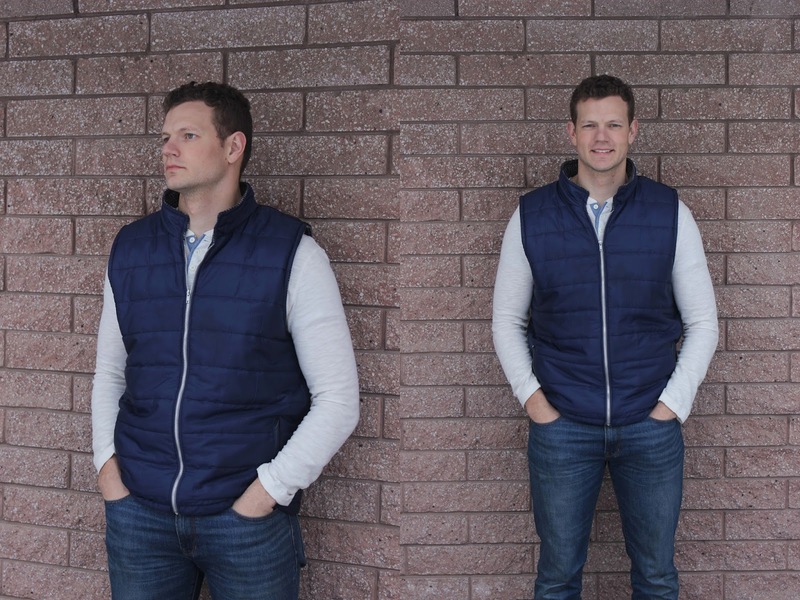 The outer vest is made from quilted polyester from my local Joann Fabrics. Yours probably has it, too and I was so happy I could get a quilted look without having to quilt the fabric myself. But if you want to quilt your fabric yourself, or can't find quilted fabric you like, instructions on quilting are also included! The lining of the vest is a Robert Kauffman Plaid flannel form Raspberry Creek Fabrics. My husband picked all his fabrics and I loved his choices. He still wasn't sure he would wear a vest but I had him pick the fabrics to make it a little more likely. I don't sew for him very often but I am getting more and more requests. He has a hard body to fit in torso length and sleeve length and he is loving the custom fit he gets from me making clothing for him. So if you've never sewn for your guy or son before - don't be afraid - most likely, they'll love it! 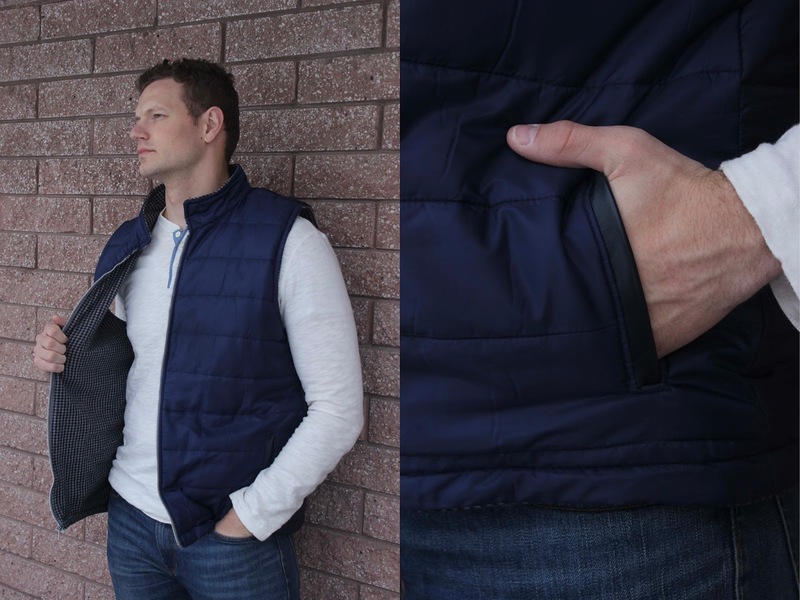 The patten is on sale currently so be sure to grab it here for only $6.50 through Saturday (and maybe the women's and kids version too) and make vests for the whole family! He wants a coat now!?! That's quite the request (and sleeves are tricky, tricky, tricky!) - love that you've brought him over to the custom clothing side - but I guess it's going to stand in the way of selfish sewing - both a pro and a con? Either way - I love your make and your husband wears it well! yeah maybe I should never have sewn for him - I need all the time for me!!! I love your version so much too but I wasn't feeling ambitious enough for flap and snaps and extra pockets...maybe eventually - since he wants another already haha! You did such a fabulous job on this!!! I love the welt accent in the vegan leather! So glad you stuck with it and that he is wearing it!! Thank you! I am so pleased that he loves it so much! I'm a gym rat, and your dh might be flattered to know that his "sloped shoulder adjustment" isn't really that, but a frequently-needed fitting change needed for guys with huge traps. yeah he's a gym rat, too! Pretty much all the adjustments I made were to accommodate large muscles...haha!